Obviously a person must learn how to live on less money than they earn if they want to manage money well enough to get out of debt. To do this you have to know how to live on a budget, or as I prefer, a spending plan. Frugal living (rightly understood) is the key to success. Frugal doesn't mean austere or excessively limited. It does mean intelligent, thoughtful and controlled spending. Fortunately it is remarkably easy. If you follow the news at all you know that there are a surprising number of stories about celebrities and sports heroes who have filed for bankruptcies or defaulted on their mortgages. I won’t name any names. I feel sorry for these people and really wish their plight wouldn’t be exploited in this way. One point is clear, however, and it is one with which we are concerned. It doesn’t seem to matter how much money a person has coming in, people are easily able to spend it. All of it. And more. No one can become successful with their money without first learning how to live on less than they make. Obviously no one can become successful with their money without first learning how to live on less than they make. And no one can hope to eliminate their debts without learning this either. Fortunately, this is not as difficult as many suppose. It does require recognizing the real issues involved and setting about to make some permanent changes in the way money is handled and managed. In the previous article of this series about debt elimination I pointed out that the degree to which people overspend is ordinarily very small. In a given month it may be higher and in another it may be lower. But on average it is only a few dollars. Calculate the numbers for yourself. See how the amount of debt compounds as you spend just $25.00 over your income each month compounded at the average credit card rate of 14%. Most people are very surprised—even shocked—to learn how little over spending is involved in building up their debts. Since over spending just $25.00 per month would produce over $30,000 in debt in 20 years, it is clear that most people are not over spending all that much. This is really good news because it means that the task of learning to live on less than we make is really not that difficult. If we know how. It seems that almost everyone who has a challenge with money issues has a story about something they have done to save money. Just this week (as I write) a friend of mine was talking about how she and her husband were changing their TV cable service in order to get a better rate. There is nothing wrong with doing things like that at any time, although most people only do it when they are feeling a little pinched for funds. No matter how often they make such changes, however, their overall situation doesn’t seem to improve. The reason for this is that without getting in full control of all your spending there is no end to the ways your money can slip away. It is like the Energizer bunny, it just goes, and goes, and goes. Getting in control of money is the most basic and important practice for anyone learning how to live on less than they make. Taking control of your money by using effective management principles helps you eliminate these black holes. Getting in control of money is the most basic and important practice for anyone learning how to live on less than they make. Learning how to get in control of your money so you can permanently live on less (even a little less) requires several important steps. Acknowledge that getting in control is the key to your success. Keep up with key information about your money such as your income, expenses, net worth, and financial goals. Develop your personal spending plan, the amount you are choosing to spend on each expenditure area each month. Most important, employ a set of checking and other accounts so your can accurately deploy your funds according to your spending commitments without exceeding your predetermined limits. Dedicate a period of time, at least monthly, to review your financial situation and make any adjustments needed. 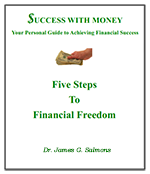 These steps are absolutely essential if you want to get in control of your money. Taking control of your money is absolutely essential if you want to live on less than you make and get out of debt. Because of the importance of this process I have devoted a whole section of my web site to it. The title of that section is Take Control of Your Money! Once a person realizes that they probably only need to save a few dollars a month, and once they get into effective control of their money, figuring out how to save a few dollars here and there is not really all that difficult. Each individual or family uses their money differently, however, so I cannot tell you what will be best for you. You need to discover the specific ways you use your money and look for ways you could practice frugal living, learn to budget money and live on less. Most of the time this is relatively easy. There are many possibilities. Furthermore, if you only need to cut back $25.00 a month you could reduce spending just a few dollars in several areas and hardly notice the difference. Reduce the number of times eating out or the cost of meals purchased. Limit the number of trips to purchase groceries and other supplies by planning weekly shopping trips. Review bank accounts for fees and change any accounts with fees to others without charges. Review car insurance coverage to eliminate coverage that no longer make sense for the age of your car. If you have annual fees on any credit cards, call the company and ask them to change over to a no fee account (not if you have a balance and rate would increase). Change or reduce TV cable services. Reduce utility expenses by installing florescent fixtures or programmable thermostats. Eliminate duplications like having both telephone land lines and cell phones. Shop more at discount stores, less at brand name stores. There are numerous internet sites that suggest ways to save money. CNN’s Money site has many articles related to saving money on gas and travel, saving money on utilities, saving money on almost anything you can name. One article that can give you a lot to think about is called Smart Money-Saving Tips You Need Now. This is on the US News & World Report site. For the most part, financial experts recommend paying off debts before saving. However, most agree that there is merit is saving some funds all along. One good reason for saving from the beginning is that you need some reserves in case of unexpected needs that may arise. If you have to borrow money for any purpose it is a discouraging blow to your debt elimination program. Frugal living and effective money management allows you to put some savings into a reserve account to protect yourself from unexpected expenses. It feels a lot better to pay from the reserve than to borrow. In fact, it is better. If you must take care of an emergency car repair, for example, it is better to have some savings set aside for it. If you have to add it to your credit card debt it could take you a while to get back to where you were before which can be discouraging. On the other hand, it feels great to know you have the money to meet this unexpected expense because you took proactive action. A second good reason for saving some money from the beginning is a psychological one. Saving money is a mental process as much as a physical one. Really it is. You’ve heard people say that someone’s money was burning a hole in their pocket. Especially with children, but sadly with a lot of adults, as soon as they get some money they start thinking about how to spend it. It is important to make saving money a habit. We learn to save by saving. It is important to make saving money a habit. We learn to save by saving. Even if it is short time saving for making some purchase, the process of saving teaches us to like saving. Slowly we will begin to replace our spending attitude with a savings attitude—and practice. This will make a dramatic difference in our ability to achieve our financial goals. A third good reason for saving from the beginning relates to our long term savings for retirement, or as I prefer to think of it, our financial freedom funding. It is important to start saving or investing for this purpose as soon as possible since time is such a significant factor in the equation. You simply cannot afford to wait long to begin saving for retirement. Years slip by quickly. You must have an emergency fund. You need to pay off debts as quickly as possible. But it is also important to start investing for the future early on. My reason for including this savings need in talking about our goal of living within our income is based on another principle as well. If you put $200.00 per month into a ROTH IRA, for example, as a necessary expense it will help you to balance your spending plan to include this crucial element. It may be a while before you will cut spending and reduce spending enough to fully fund this part of your savings. However, it is important to start your retirement fund as soon as possible for the reasons presented above. Don’t wait until you can afford a large amount each month. Start small and work your way up gradually. If you start with even $25.00 each month it will remind you of your intention every time you make a deposit. Soon you will be up to $200.00 or more. Our central target for this series of articles is on eliminating our debts—learning to live on less than we make is a vital part of the program. Unless we get in control of our money, practice frugal living, and learn how to budget money we will be unable to stay out of debt once we get there. Now that we have established the foundation for making the program really work, we are ready to set out our plan for actually paying off the credit card and other debts. My article, Work Out Your Debt Payoff Plan focuses on this key process.